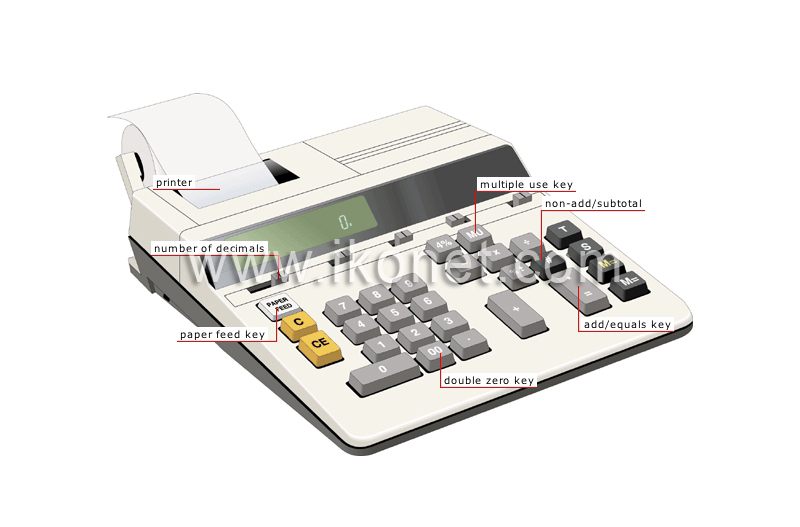 Office calculator with an integrated printer; it is used mainly in business and administration. Key used to move the paper forward. Key that enters two zeros; it is used to speed up the entry of large numbers. Key used to display the results of operations carried out; on some calculators, it can also be used to do repeated calculations. Key used to print numbers other than calculations (codes, dates) or to obtain the results of an operations subset. Device that makes a hard copy of data transmitted by the calculator. Key that facilitates certain financial calculations (margin, selling price, costs). Device used to adjust the number of decimals making up the fraction of a number.